Take the trip through public railways line with the lorry train, will absolutely give you a different view of Gumitir Valley scenery in the west of Kalibaru. Gumitir Valley and Mount Mrawan are two great natural barrier in the old time that make Banyuwangi and Bali Island isolated for centuries from the rest of Javanese civilization. The railways and tunnel tunnel which built in 1901 to 1910 by the Dutch had changed the history. An adventurous tour through a mountainous part with its romantic view. 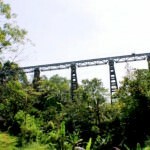 Entering two tunnels respectively 684 and 113 meters long each, and passing upon one of the longest hanging bridge in Java, 200 meters long and 80 meters above a deep valley and ravine. Please be advised, sometimes the lorry can not be operated due to the route changing of public train schedule. This tour available everyday with 2 times departure, 07:30 am and 10:30 am.